Light Up Depression is an event that has been held the last two years at Round Rock High School. The main goal of this event is to promote mental health awareness in Round Rock – to break the stigma and alter the narrative with mental illness. 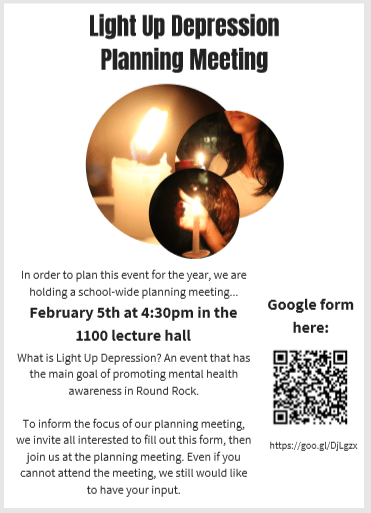 In order to plan this year’s event, we will hold a school-wide planning meeting on February 5th at 4:30pm in the 1100 lecture hall. All interested students and staff are invited to attend. To inform the focus of our planning meeting, we invite all interested to fill out this form, then join us at the Feb 5th planning meeting. Even if you cannot attend the meeting, we still would like to have your input.